Preground electrodes and specialty electrode materials are being used to enhance the performance of gas tungsten arc welding (TIG) and plasma welding of wires, needles, pacemakers, medical tools and components, bellows, batteries, and a variety of precision instruments. 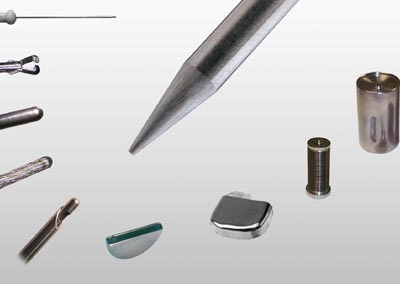 High-quality electrode materials with exact tip geometry tolerances offer a noticeable difference in precision at the arc to produce higher-quality welds with much longer electrode life. Elderfield & Hall / Pro-Fusion is offering the technology and services to use specialty electrode materials with pre-ground electrode tips to enhance precision arc welding. Pro-Fusion is offering preground welding electrodes, Sharpshooter tungsten electrode grinders, several tungsten alternatives, and a new line of plasma welding torches. Pro-Fusion's customer, J&J Precision of Thomaston, CT, offers contract welding that can involve sealing the ends of small tube diameters. J&J makes eyelets and performs stamping, forming, machining, grinding, and assembly of precision metal components. J&J's owner, John Maxwell, investigated the latest arc welding technology not as a joining, but as a heating and sealing, procedure. By using precision preground electrodes with a micro-arc welding system, Maxwell was able to seal the tube by momentarily imposing a welding arc on its ending. This melted the tube and produced a smooth hemispherical surface. The preground electrodes ensure accuracy and repeatability, according to Pro-Fusion. J&J uses the same technology for rod and wire end rounding, welding of custom endings to tubes, and creation of ball endings on wire. Other applications for pre-ground electrodes include repetitive welds on identical parts, quality or critical-function welds, and parts with significant accumulated value prior to welding.